Lips of Faith | Beer Blotter: Seattle based. World focused. Commercial Description: Ever met a New Belgium Beer Ranger? They are our beloved folks out in the field. Spanning all 26 of our states from the Pacific to the Atlantic, our Beer Rangers do their best to protect, to pour and to partake. And explore many a beer from many a brewery, they do. The fellows up in the Northwest kept calling for “more hops!” Soon it became a common theme across the land. Rangers, fans and craft lovers everywhere were searching for hoppier beers. So, here it finally is – New Belgium’s foray into the true American India Pale Ales. Bring out the hops! This clear amber beauty bursts at the starting gate with an abundance of hops: Cascade (citrus), Chinook (floral/citrus), and Simcoe (fruity) lead off the beer, with Cascade added again for an intense dry hop flavor. Brewed with pale and dark caramel malts that harmonize the hop flavor from start to finish, Ranger is a sessionable splendor for all you hopinistas. Thank your Beer Ranger! New Belgium Brewing is a force. According to the Brewers Association they are the third biggest craft brewery in America behind Boston Beer Co. (Sam Adams) and Sierra Nevada Brewing. That’s pretty damn big, but it’s pretty much impossible to hate on them. They may have what feels like endless funds to put into mass marketing, and their product often feels as though it’s pretty much everywhere, but ultimately, their conscientious nature will win you over. NBB is an employee owned company. They use wind power and sustainable energy. They travel the country asking commuters to give up their cars in exchange for a bike, all in the name of reduced emissions. Oh yeah, they also put a lot of effort into their product. From the omnipresent Fat Tire Amber to Blue Paddle Pilsener. From the Abbey Belgian Style Ale to the great wonders of the Lips of Faith series (they actually brought on a Belgian brewer from Rodenbach, Peter Bouckaert, to start their sour program). These guys practically brew the entire gambit, except for an IPA. Well, that’s what we were all saying about a year ago. Finally, the Belgian inspired brewers came around to the great American craft brewing tradition. IPA! Hops! Once again, the PNW influence trickles down. I doubt that there has been very many standard IPAs made in the last 5 years, especially by the larger craft breweries, that were released to more enthusiasm than Ranger IPA. It seemed as though everyone wanted to taste New Belgium’s interpretation of the style. I was definitely amongst them. That’s what you get when you go so long, and do so many great things in brewing, without brewing an IPA. They set themselves up for success with Ranger, and if you ask me, there was never any doubt that it would be good. The question would become, just how good? We will answer that question in just a bit. Bottles hit the market in early 2010, shortly followed by cans. I for one, with the exception of keg purchases, have not bought more of any one beer in the last… probably 4 years, than Ranger in a can. Whenever I found it, I bought it by the case. A really good IPA in a can is a thing of beauty my friends. 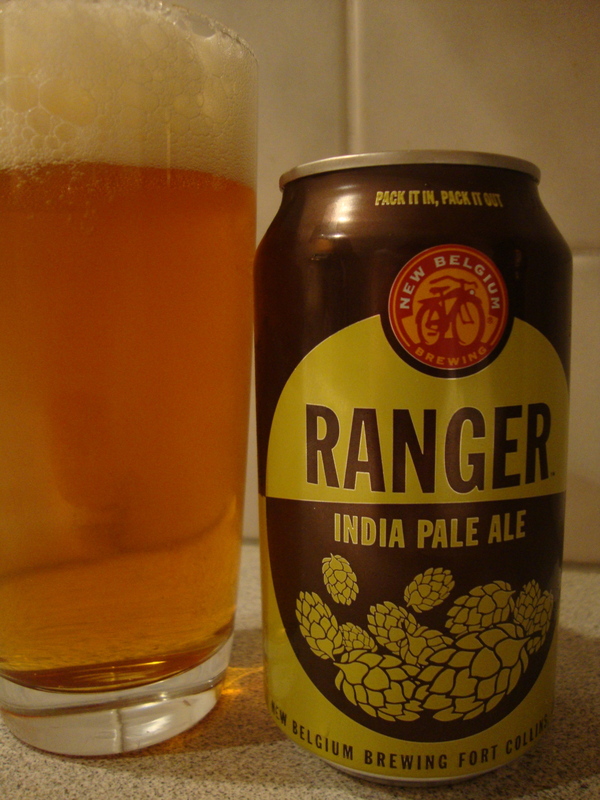 Sadly, I understand that NBB has recently ceased canning Ranger, though I hear it just may return in the fall or winter. New Belgium, if you are out there listening, hear me beg – please continue to can it. I will do my part to make it worth your while. The color and head are magnificent! The brew is a bright and clear orange color, leaning more toward yellow than amber. The head is luscious – pure white with big bubbles and excellent lacing. Massive clumps of foam adhere to the inside of the glass as the liquid level recedes. The odor is very layered. There is a lot of cascade hops present from the dry-hopping. Citrus and pine come to mind first. The crystal malts lend a wonderful caramel balance that makes my mouth water. Deep within it all there is a slight burn, but at 6.5%, this must be pungent hop oils. At times I get a waft of pure malts, like the smells that fill the brewery when mashing in, but the hops always return. I sense that condensed pellets were used to extract the potency of the leaf. The carbonation is spot on and the liquid is soft…not to dry, not too slick. Nothing to complain about here. The flavor is, ultimately, what we are after here. Balance is what I need in an IPA, and I know that that isn’t always true for other hop lovers. If you want a bitter bomb, this isn’t for you, it’s for me. Yes, bitterness plays a role, but it is mostly corralled deep into the aftertaste. “Hop candy” is the way I would describe my favorite IPAs, and though this is sweet, it’s not candy. But then again, I can’t session hop candy, so this is just what I need. Do you see why I buy this by the case? The aftertaste is slightly dry and bitter on the back of the tongue, but all other bits of the mouth play host to caramel sweetness. The sugars latch on and keep me sipping. 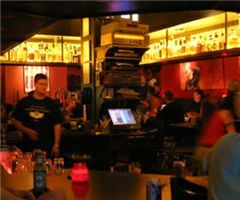 Though this may sound a bit primitive of me, due to the carbonation of our beverage of choice, there periodically comes a time when a burp just may sneak out, and I must say that it was pleasant not only to relieve the pressure within, but in flavor. I felt as though I myself had been dry-hopped. This is a really good IPA by a really good brewery. You should drink it.